Get the deep rich flavor of your favorite stout in my Beef Guinness Mini Pies. The perfect size to warm your heart and your belly while being the ideal partner to a cold Guinness Stout. Your perfect St. Patrick’s Day begins with these! March is still pretty chilly in most places so even though you are celebrating Spring arriving and possibly St. Patrick’s Day, you need something hearty and warm. My Beef Guinness Mini Pies are just the things you are looking for! Hearty shredded beef, cooked in a rich sauce and studded with vegetables can be served as is or tucked into flaky, portable packages. Doesn’t the sound of that get your belly rumbling and your mouth drooling? 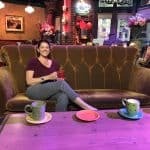 Now this recipe may seem long, but I am of the mind to prep ahead so I have lots of options on hand when the mood strikes. This beef and Guinness roast is no exception. Brown your chuck roast (2-3 pounds) in olive oil and then remove to a plate while you prep the rest of the sauce. Once you get the pearl onions, carrots, and peas in the pot cooking, add in the broth and that delicious Guinness. Return your beef to the pot and bake until the meat is tender and the broth/beer combination has reduced into a glossy, thick sauce. At this point, you can serve the Beef and Guinness as is, along with some creamy mashed potatoes and roasted carrots, or you can save for the mini pies I’m making right now. Either way, this roast will blow you away! It will certainly keep me warm on a chilly night while I’m sipping a beer. While getting this recipe together I discovered that Guinness now has a blonde ale that is just as delicious as their Draught Stout. If you like Guinness it is a must try! If you are making the Beef Guinness Mini Pies shown here, make sure you have your pie crusts ready to go. I love a homemade pie crust just as much as the next person but if you are not inclined to make one, don’t already have one prepped in the freezer, or are running short on time, buy some already prepped in the refrigerator section of your store. No shame in that game at all!! I actually stock up on puff pastry when it goes on sale and store it in my fridge for just such occasions. Next, grab your muffin pan and some circle cookie cutters. You will need two different sizes or you can use a plastic cup like me. I couldn’t find my cookie cutters since they are packed away and I didn’t feel like rummaging through boxes in the garage. Since the plastic cup was tapered I used both ends to get the two different sizes. The pies need two sets of crusts, one set slightly larger which is the bottom crust. It will make a “cup” to hold the filling while the other will top the pie. Place your filling on the larger crust, top with the smaller one, crimp the edges to seal, and place in a muffin pan that has been coated with non-stick spray. Make sure to cut a little opening in the top to release the steam while they are baking. Bake until the crust is golden brown and the filling is bubbly. Remove and let them cool briefly before grabbing a few. The Beef Guinness mini pies can be served by themselves and can be portable but I like these on a small plate. If you are looking for something portable a hand pie is perfect! 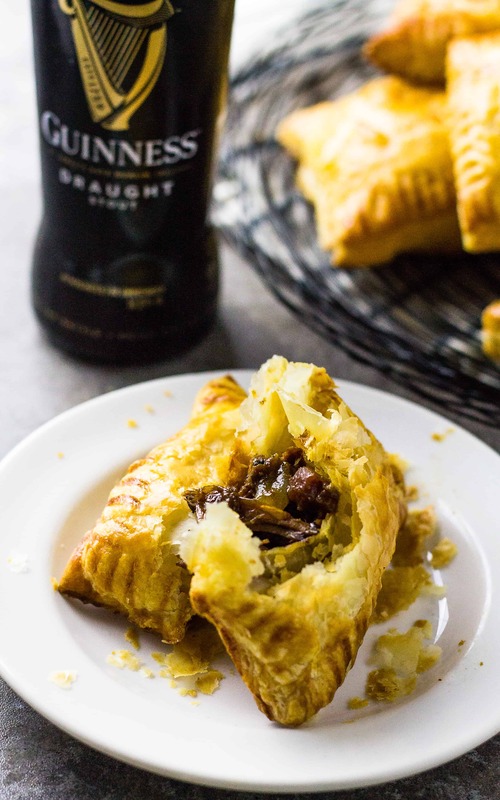 Whether you are celebrating St. Patrick’s Day or if you just really like Beef Guinness Mini Pies for a Thursday meal, grab this recipe! If you are in the mood to make these Beef Guinness Mini Pies into turnovers for your lunch box or a portable snack while also holding your Guinness, add the filling to puff pastry and bake. Look how gorgeous they turn out!! Get the deep rich flavor of your favorite stout in my Beef Guinness Mini Pies. The perfect size to warm your belly along with a cold Guinness Stout. In a large dutch oven (or heavy pot with lid) heat 4 tablespoons olive oil over medium-high heat. Dry the chuck roast thoroughly and sear on all sides in the olive oil. Remove the chuck roast and place on a plate to rest. Add the onions, carrot and pea mixture, and cook for 3 minutes until they start to soften. Add the tomato paste and capers, and cook for 1 minute. Add 1 cup of the broth, 1 cup of the Guinness, Worcestershire, and thyme. Stir to combine while gently scraping the brown bits of the meat from the bottom of the pan. Return the beef to the pot and cover. Cook at 350F for 1 hour. After 1 hour, remove the lid, flip the roast, and add the other cups of broth and Guinness. Bake uncovered for another 1 hour or until meat is tender and the liquid has reduced to a thick sauce with the vegetables. When the meat is done to your liking, remove from the oven and let rest at least 10 minutes. You can serve now as part of your dinner or you can turn them into mini pies or hand pies. *I like to refrigerate my beef and sauce overnight and make my pies the next day. Unroll the pie crusts and cut 3-4 inch circles out of the dough. You should get 7 circles from each crust just be sure to make one set slightly larger than the other so you can have a bottom crust to the pie and a top one. Place about 2 tablespoons of beef and sauce (I shred the beef and combine back with the sauce) in the center of a larger circle of dough. Top with a smaller circle. Roll or crimp the edges to seal the pie. Cut a steam slit in the top. Place the pie into a greased well of a muffin pan. Continue with the remaining 6 pies. Brush with an egg wash (1 whole egg + 2 tbs water mixed) and bake for 20-25 minutes or until the crust is golden brown. Remove from the oven and serve warm with an ice cold Guinness! Remove the 2 sheets of puff pastry from the refrigerator. Unfold and roll out slightly. Cut each sheet into 9 even squares. Place 2 tablespoons beef and Guinness mixture in the center of each square. Top with another puff pastry square. Seal the edges with a fork or crimp. Bake at 400F for 25 minutes or until the pastry is golden brown and flaky. *If you don’t like Guinness, feel free to use your favorite beer. *Be sure to thaw your puff pastry overnight in the refrigerator or for 3 minutes at room temperature. Place 2 tablespoons beef and Guinness mixture in the center of each square and you are good to go!! Awesome recipe!